To add Atour to your favorite websites folder, click on the link above. Welcome to the Assyrian Exchange Network! The Internet is an amazing ecosystem of information. It has the power to change the way we live, and we're beginning to see that potential every day. This network was established to help connect Assyrians with other Assyrian related websites. The latest community news from the Assyrian Forums and Assyrian websites worldwide, including international news. Don't have an RSS feed? 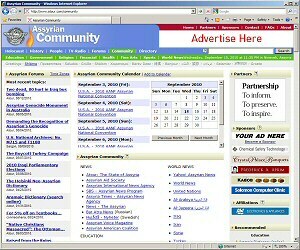 Visit the Assyrian Community: RSS Feeds Information to learn how to create one for your website. 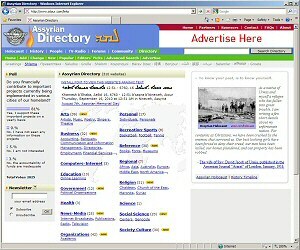 A comprehensive Assyrian search engine and website directory. Add, search and visit many websites. Add your Assyrian group, organization or company, including your homepage or website information (if available) to this free online directory. We support sharing and social networking, and have made this website's documents easier to share with family, friends, and colleagues by having social sharing links within them. Documents have the green-colored "Open Share" icon appearing on the top of the pages, that when clicked, will scroll directly to the end of the page to the social sharing links. Feel free to share this website's links of important documents on other websites to promote further awareness to the plight of the Assyrians. These website marketing media have been created to promote online campaigns and local community events. 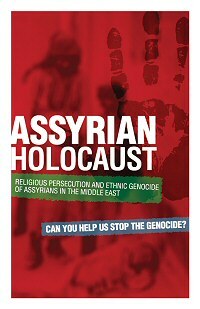 The website banner images are available in various sizes and can be downloaded, displayed and linked from other websites to the Assyrian Holocaust website. Feel free to copy, distribute, and print the high-resolution PDF posters at your local printing store and display them in your campaigns. WAUKESHA, Wisconsin, April 15. - Dr. Joseph Shimoon, a former student of Carroll College, Waukesha, and who was a member of the 1903 class of the Jefferson College, Philadelphia, was burned at the stake and beheaded in Persia, according to advices reaching here from Philadelphia. No date was given in the reports but they show that Dr. Shimoon was seized at Urumiah, Persia, by Turks who tried to compel him to embrace Islamism. Upon his refusal and statement that "Jesus is my Savior," he was seized, set on fire, burned to death and beheaded. -- The New York Times, 16 April 1916.